Please, make sure you have already read the System Requirements article before you proceed. Go to to the Telerik UI for Xamarin download page following the instructions in Download Product Files topic. Once the download completes, run the MSI file and follow the instructions. 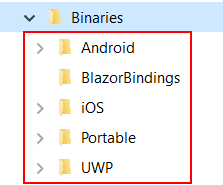 On a 32bit machine the wizard will install the UI for Xamarin component in the following folder unless you specify otherwise: C:\Program Files\Telerik\ or C:\Program Files (x86)\Telerik\ for a 64bit machine. If you prefer using the ZIP file with the dlls instead of the automatic installation you can check the Manual Installation for Visual Studio help article.